AdChief aims to significantly shorten the entry barrier of adopting dynamic product ads and transform the way how conventional digital advertising works. Jakarta, Indonesia: On 23 October, Tagtoo will be launching AdChief, a total solution platform for dynamic product ads in major advertising networks, such as Yahoo, Google, and Facebook, at Tech in Asia Jakarta 2018. This powerful platform allows advertisers, e-commerce, in particular, to create hundreds of thousands vibrant and beautiful banners of different formats in 5 minutes without the need of objects upload. Most importantly, advertisers can allocate their original budget and deliver ads to different advertising networks all in AdChief. Dynamic products ads is able to strikingly improve digital ads campaign performance. According to Tagtoo self-built database, which accumulates 6 billion USD transaction data, clients adopting dynamic product ads see 35% decrease in ads cost and 45% increase in conversion counts, as compared to traditional static banners on average. Moreover, dynamic product ads helps get 30% higher return on ad spend (ROAS) overall. No service charge. Only pay how much the ads costs. Tagtoo, founded in 2011, is a performance marketing company that's based in Taiwan and has offices in Malaysia and Indonesia. 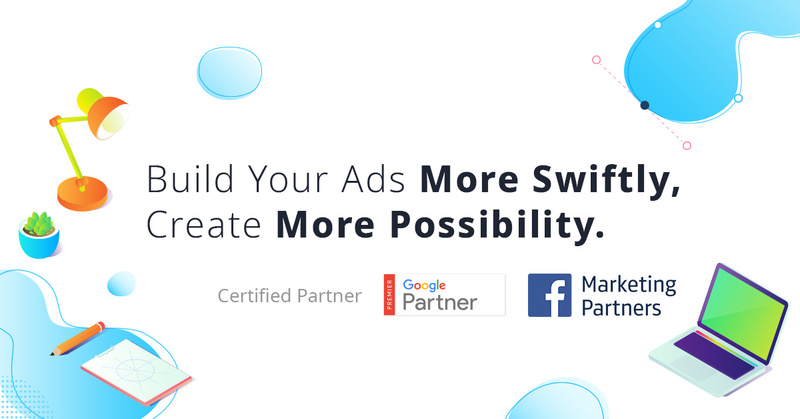 We specialize in managing Facebook, Google Ad with data-driven strategies and proprietary technology. Tagtoo is selected as the Top 3 Google agencies in Hong Kong/Taiwan market among hundreds of competitors. Currently, over 80% of e-commerce has adopted Tagtoo’s solutions to drive sales in Taiwan.